IntimacyI remember someone asking my husband and I during the first few years of our marriage what is Intimacy? The definition we both first conjured up in our minds was mostly physical. But as we matured and grew, our understanding of intimacy grew also. Our relationship has grown throughout our 27 years of marriage. Like most couples we began with a physical attraction that grows into a deep love that was never imagined when the “I do’s” were exchanged. We have raised babies, bought homes, owned a business together. We have survived arguments, financial challenges, unemployment, loss of our fathers, and much more in our years together. My children think we are too affectionate towards each other, because we truly enjoy each others company (and like to kiss and hold hands). But when you get either of them alone, they admit they like the fact that their parents are still attracted to each other and still are in love with each other. My expressive Italian husband is very passionate about life. When he laughs, its genuine and heartfelt. When he enjoys a good meal, he soaks it all in, from the smells to the presentation to the taste. He is passionate about his family – giving, kind and loving. Passionate is the word I would use to describe him. He is not perfect, but he is perfect for me. I love the way he holds my hand in his, I feel so safe, so loved. I can spend all day just hand in hand with him. I pray every person could experience the trueness of love from someone else. I know there is a lot of hardship in the world, but sometime we just need someone to reach out and hold our hand. Recently, I received some hard news, and the person who explained everything to me, sat next to me and held my hand. I remember looking at her hands and thinking, it’s exactly what I needed, I needed human touch as I was told this. Then I prayed for all the people who live days, weeks, months and even longer without human touch, without the intimacy of someone knowing them and being present for them. I felt sad, but not for me, for all those without another presence in their life. My life is blessed in so many ways. I will survive my hardship no matter how thin the rope I’m hanging on to becomes…because I have a loving family always ready below to catch me and carry me until I can walk upright again. As a youth minister, I have helped many people through churches, retreats and worktours. But when this caregiver held my hand, I realized the importance of always, continually, without ceasing, reaching out to touch others. May your day open your eyes to the opportunities to hold the hand of another and know the true meaning of intimacy. Have you ever heard a story that you wanted to hear again and never tiring of it? Maybe I just enjoyed hearing my father tell it, with a few interjections from my mother. Dad always had a twinkle in his eye when he told the story reminiscing about their beginning. I would ask as a child. I asked as a teenager, and I asked as a mother. My children loved hearing the story and would ask for Dad to tell it to them. Even while fighting lymphoma, when asked, Dad always got that twinkle in his eye and grin on his face and my mother would smile and say “I can’t believe you still remember”. Dad’s no longer with us on earth, but today would have been their 53rd Wedding Anniversary. In honor of his memory and the years they shared together, enjoy the story. “I was going to a dance with some friends at 79th and Halsted and saw a group of good-looking girls crossing the street, so I swerved my car to make them jump.” Dad grinned. Mom fluster and annoyed would explain to him the deep v neck belonged in the back, not the front and she was wearing it correctly. By the end of the dance Dad had asked for her number, which she gave him. She said “Are you going to write it down?” Dad replied “no, I got it” not even repeating it for her, but he would remember. Mom walked away from the dance thinking he didn’t remember my number and he is not going to call. We always knew the best part way coming. We would turn to Dad and say “did you remember her number?” To which he always replied, “WO9-3779” Then my Mom and Dad’s eyes would meet, his twinkling and hers smiling. You could see the love of those two young dancers. Mom always was amazed that he still remembered the number, but everyone who heard the story and knew Dad, never questioned his love that began with the dance, the dress and the phone number. Throughout their whole marriage, I loved watching them step onto a dance floor and move as one person always in step together, Dad leading and Mom enjoying the dance. Just like the 49 years they spent dancing in this life. Each time they took to the dance floor it would bring back the memory of their first dance. 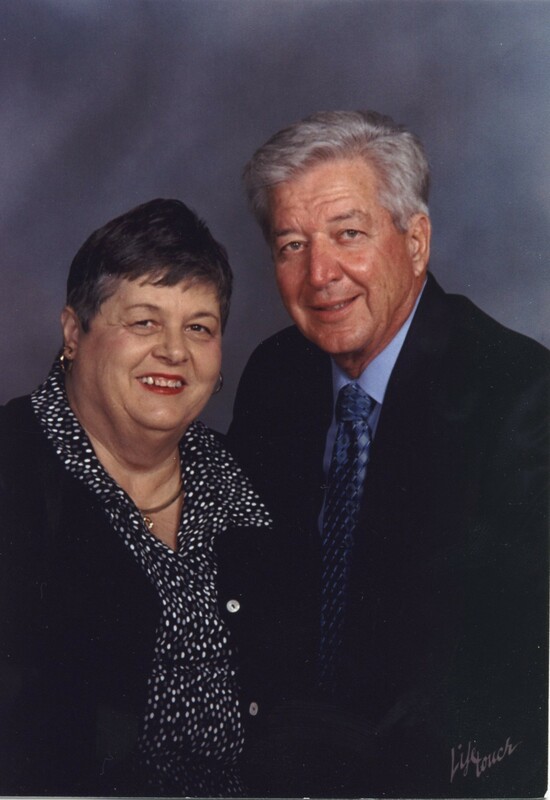 Happy 53th Anniversary Mom and Dad – I Love You! !